First question – what contrast medium should I use? 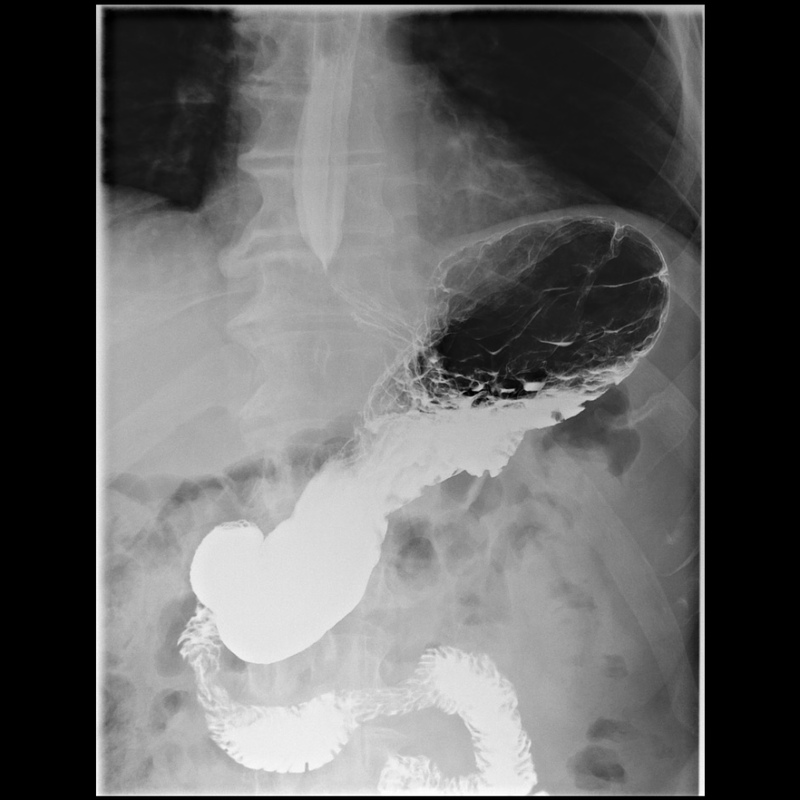 Does the patient have suspected aspiration, perforation or a history of recent gastrointestinal surgery? If so use a low osmolar water-soluble contrast medium such as Gastromiro (Iopamidol). For everyone else use a barium sulphate suspension such as Baritop 100 (in suspected aspiration you can swap to barium sulphate suspension once you have excluded it with water soluble contrast medium). 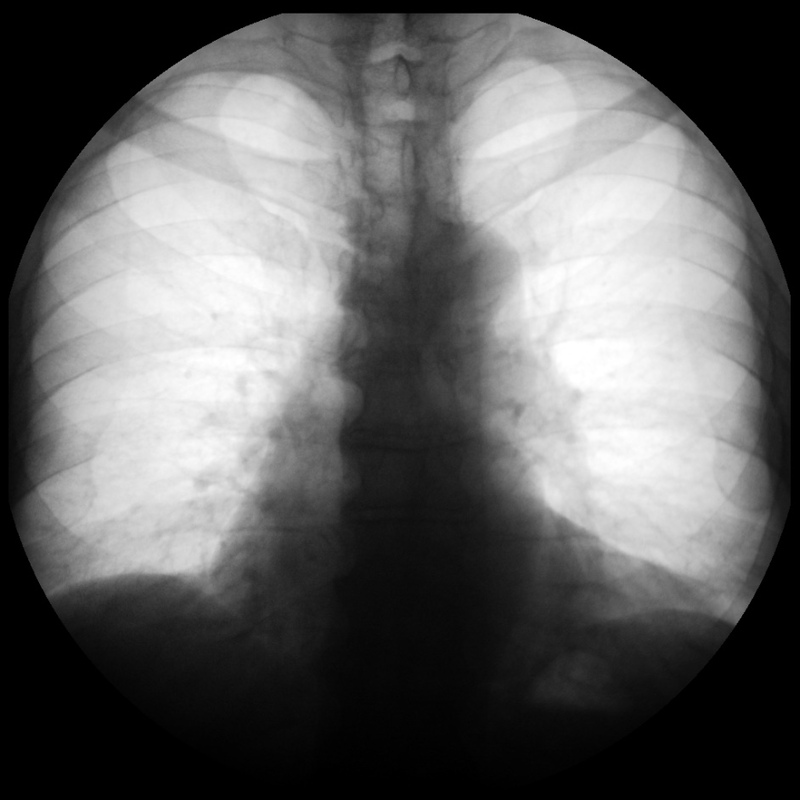 If possible, it is better to use barium as it absorbs x-rays much better and therefore gives more detail. Never use Gastrografin as if aspirated it can cause pulmonary oedema. 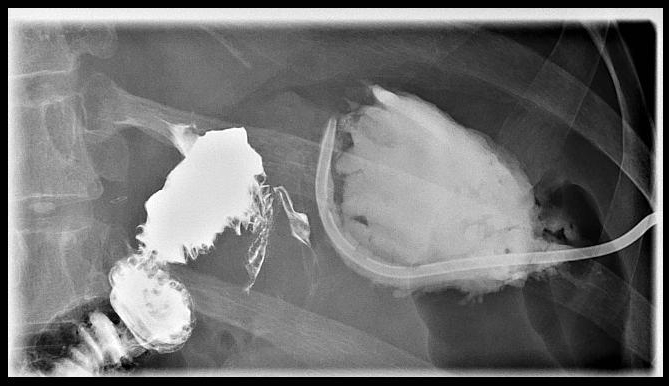 Aspiration of small amounts of barium is not a problem. Figure 1 – comparison of barium on the right and water soluble contrast medium on the left. 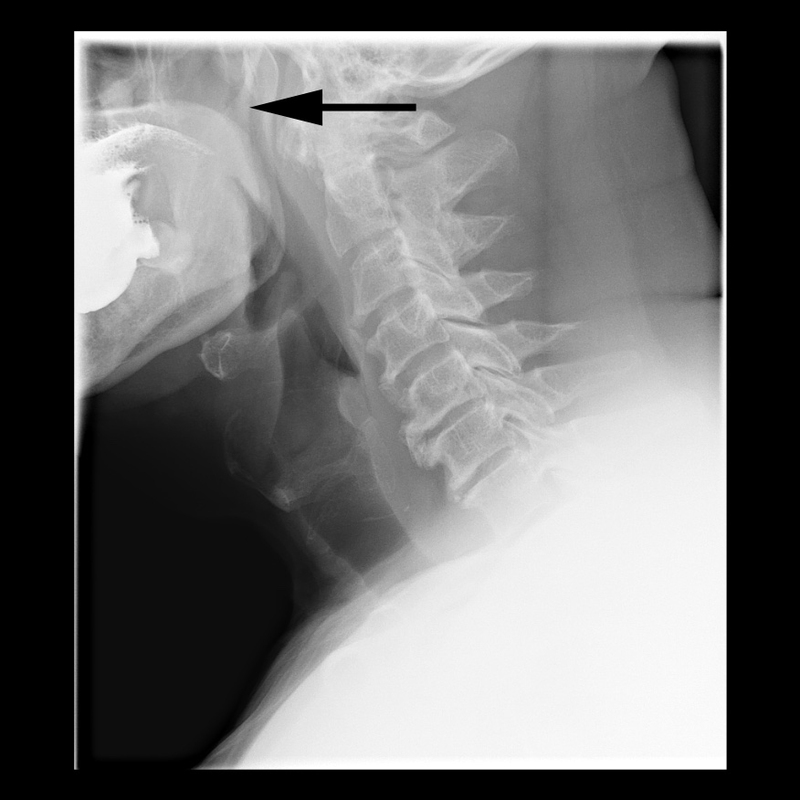 If the patient has had previous neck or thoracic surgery then control films are a good idea – these should be AP and lateral of the neck, and an AP of thorax. This is one of the most important views in the examination so have a low threshold for repeating this. The lateral view of the upper oesophagus and pharynx should include the top of the palate. Settings: Medium magnification, 4 frames per second. Timing: Foot down as you say “Swallow!” or just before. Foot up as soon as there is maximal distension of the most distal part of the visible oesophagus. 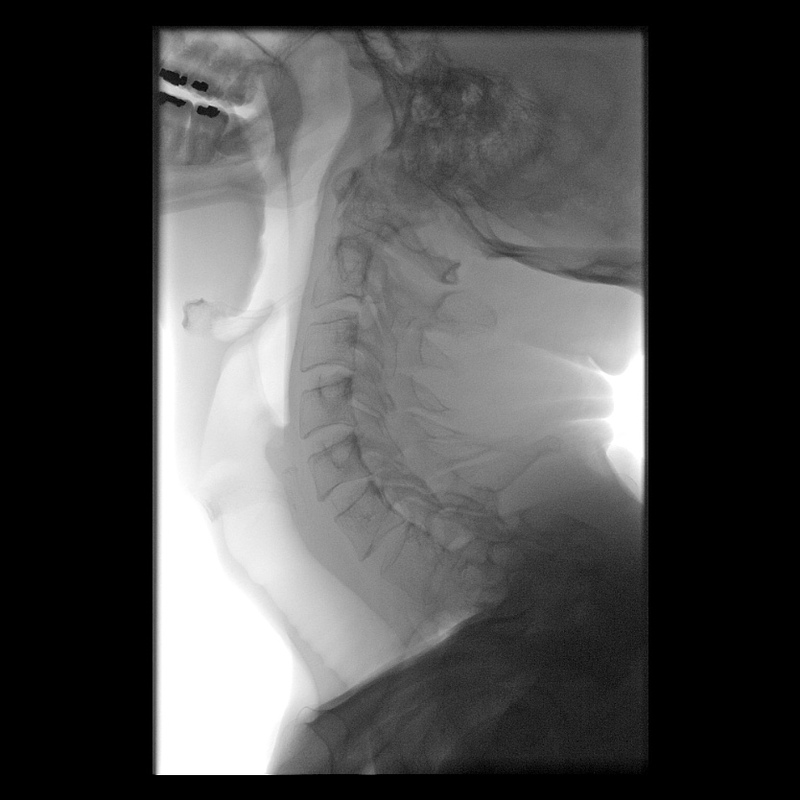 The PA view of the upper oesophagus and pharynx should be taken at the same level craniocaudally as the lateral view, but with slightly tighter coning to produce a narrower image. Apart from asking the patient to turn towards the detector and coning, little change in machine position is required. 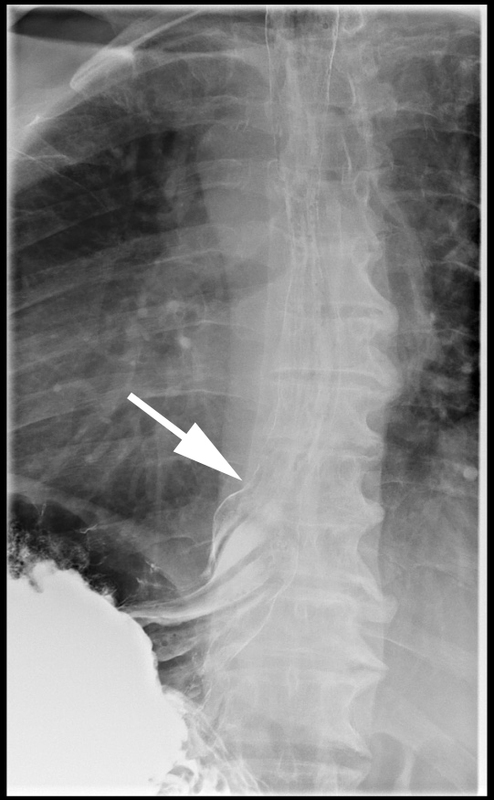 The middle part of the oesophagus is imaged in the right anterior oblique (RAO) position, with the patient’s right shoulder closer to the detector than their left. Many people give Carbex to try to get double contrast images of the oesophagus at this point. Cone in laterally as narrow as you can without obscuring any of the oesophagus. With practice you can follow the bolus inferiorly to take in the distal oesophagus too. Settings: Low magnification, 2 frames per second. Timing: Foot down just after you say “Swallow!”. Foot up as soon as there is maximal distension of the most distal part of the visible oesophagus. Settings: Medium magnification, 1 frame per second. Timing: Foot down 2 seconds after you say “Swallow!”. Foot up as soon as there is maximal distension of the gastro-oesophageal junction. After you have repositioned the patient, move the machine to include the gastro-oesophageal junction with as much of the oesophagus as you can. You should record at least one run in this position, ideally as a fluoro loop rather than full exposures. If the initial run shows normal motility, it should be repeated twice to confirm that motility is reproducibly normal (the images of the second and thirds runs don’t need to be stored unless they are abnormal). Settings: Low magnification, ideally as a fluoro loop or if not possible as 1 frame per second. Once the oesophagus is clear of contrast medium, ask the patient to roll onto their back. As they do so, screen to look for gastro-oesophageal reflux. If this is demonstrated, take a single exposure of it. A contrast swallow is not sensitive or specific for reflux. Although a small amount of reflux is of questionable significance, reflux as far as the aortic arch is considered significant). Once the prone images have been obtained, ask the patient to roll onto their back and bring the table back into the vertical position (remove the pillow as you go). 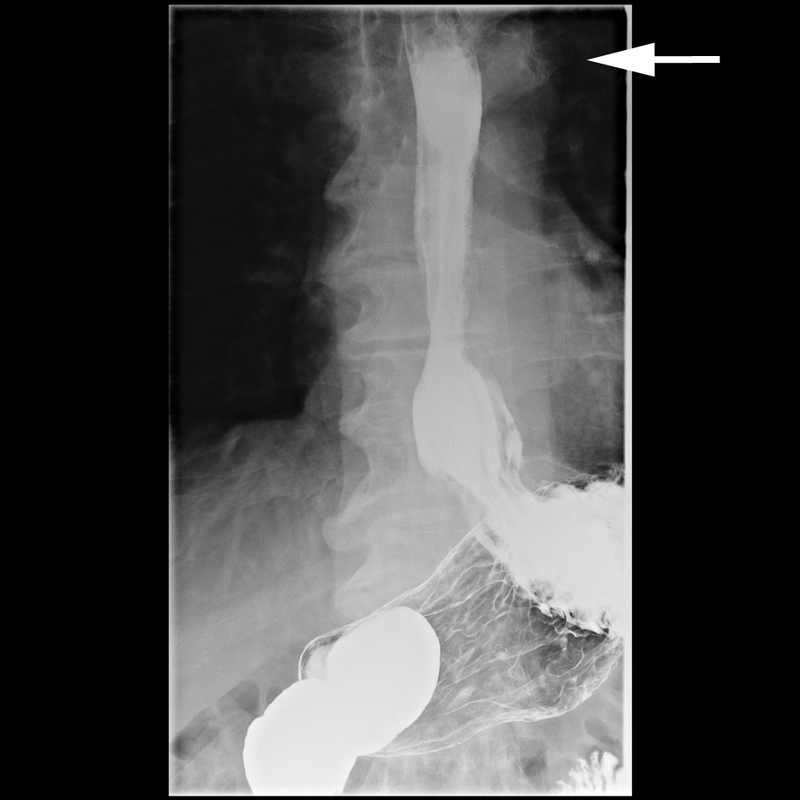 A final single image of the gastro-oesophageal junction and fundus of the stomach is taken in the erect position. This is particularly important for looking for junctional tumours. Settings: Medium magnification, single exposure. Timing: Expose while the patient holds their breath (usually in full expiration) for a clearer image. 1. If the patient has symptoms suggestive of a pharyngeal lesion for example globus symptoms, add in pharyngeal manoeuvres. Single exposures in the PA and lateral positions are taken whilst the patient does a Valsalva manoeuvre. These images are then repeated while they say “eeeeee”. 2. 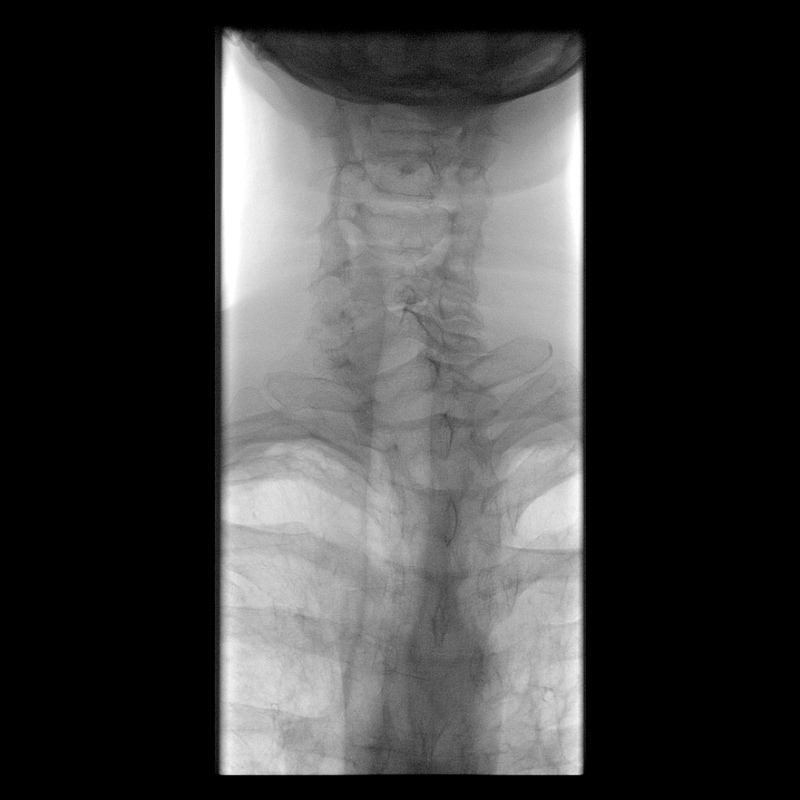 If there is poor emptying of the oesophagus after imaging in the erect position, before moving the patient prone wait five minutes and take a single exposure. If there is still retained contrast medium in the oesophagus at this point, ask the patient to drink some warm water. Prompt emptying at this point is strongly suggestive of achalasia. 3. If the patient has a clear history of dysphagia, but the standard images are normal, add in a solid swallow. This can be a biscuit or marshmallow dipped in barium. This addition is very useful for picking up extrinsic compression where the mucosa looks normal.